During the construction process, a property owner (or his or her lessee) may ask the contractor for a mechanic's lien waiver in exchange for a full or partial payment. Michigan defines four permissible types of lien waivers. These include: (1) Partial Unconditional Waiver, (2) Partial Conditional Waiver, (3), Full Unconditional Waiver, and (4) Full Conditional Waiver. M.C.L. 570.1115(9). Use a full conditional waiver of lien when the claimant receives full payment for his or her contract from the owner, lessee, or designee. M.C.L. 570.1115(4). A waiver of a lien under this section takes effect when a person makes payment relying on the waiver, unless at the time the payment was made, the person making the payment had written notice that the payment or consideration for the waiver has failed (i.e., the check bounced at the bank). M.C.L. 570.1115(6). 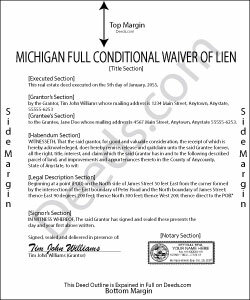 Lien waiver forms must be in writing and must comply with Michigan law to be valid. Include the names of the contractor and the property owner, and identify the property and dates covered by the recorded lien. Lien waivers can be confusing and issuing the wrong type of waiver (or issuing one too early) can result in dire consequences for mechanic's liens. Contact an attorney with questions about waivers or any other issues related to liens in Michigan.